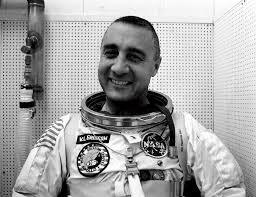 Today in Masonic History Virgil Ivan "Gus" Grissom passes away in 1967. Virgil Ivan "Gus" Grissom was an American astronaut. Grissom was born in Mitchell, Indiana. He attended Mitchell High School While still in high school he would go to the near by Bedford Airport. There he would take an interest in flying. An attorney in town who had his own plane started taking Grissom up for a $1 a flight and taught him the basics of flight. In November of 1943, Grissom pre-enlisted in the Army Air Force when he successfully completed the entrance exam. When he graduated in 1944, Grissom joined the Army. After being inducted at Fort Benjamin Harrison, he attended boot camp and was assigned as a clerk in Texas. As the war ended, Grissom sought a discharge. He would use his G.I. Bill to enroll in Purdue University in 1946. He would graduate from Purdue in 1950 with a Bachelor of Science degree in Mechanical Engineering. Grissom re-enlisted, this time in the newly formed United States Air Force. He was accepted into cadet flight training and in 1951 would earn his pilot wings. After traveling to several bases around the United States, Grissom was attached to the 334th Fighter Squadron of the 4th Interceptor Wing stationed at Kimpo Air Base. Grissom flew 100 combat missions as a wingman and never engaged in aerial combat. In 1955, Grissom was reassigned to the United States Institute of Technology. There he earned Bachelor's degree in Aeromechanics. In 1956 he would be assigned as a test pilot. In 1958, Grissom received an official teletype that was top secret. He was directed to go to an address in Washington D.C. in civilian clothes. There he learned he was one of 110 pilots who had been chosen to learn more about the new American space program. He would be subjected to a battery of physical and psychological tests. During the test he was almost disqualified due to hay-fever, fortunately the doctors realized that there would be no ragweed pollen in space. In 1959, Grissom received official word that he would be one of the 7 Mercury astronauts. On July 21, 1961, Grissom was the pilot of the second Gemini mission. The capsule officially was Mercury-Redstone 4, it is more popularly known as Liberty Bell 7. After splash down emergency explosive bolts on the capsule blew. Grissom was able to get out of the capsule, like Liberty Bell 7 his suit began to fill with water. Despite an attempt to save the capsule it sank and Grissom was rescued. Questions about Grissom's actions in the capsule loomed. Eventually doctors were the ones who cleared Grissom. The emergency bolts on the capsule were triggered by hitting a switch so hard that it was unavoidable that the pilots hand would be bruised, Grissom had no bruise on his hand. In 1999, almost 40 years after Grissom's flight, Liberty Bell 7 was recovered. Unfortunately it provided no addition clues as to why the explosive bolts blew. In 1964, Grissom became part of the Gemini program. In 1965 he would become the command pilot of the first manned flight of the Gemini program. He would become the first NASA astronaut to fly in space twice. As a reference to the incident with Liberty Bell 7, Grissom would name his capsule Molly Brown in reference to a popular Broadway play The Unsinkable Molly Brown. NASA officials demanded that Grissom change the name, so Grissom and his Pilot suggested Titanic. NASA executives relented and allowed the capsule to be named Molly Brown, but the name was not to be used in any official capacity. That lasted until launch when Gordon Cooper, one of Grissom's fellow Mercury astronauts, gave stated to Grissom and his pilot after launch "You're on your way, Molly Brown!" Grissom would also be one of eight pilots on the NASA para-glider research vehicle. Also during this time, Grissom worked closely with McDonnell Aircraft. It was during his time with McDonnell aircraft that he invented the multi-axis translation thruster control. The control would enable the docking of vehicles and would be critical to the coming Apollo program. Grissom would become part of the Apollo program when it began. On January 27, 1967, after Grissom and two other astronauts were performing a pre-launch test of the first Apollo Mission, Apollo 1. An accident inside the capsule caused the Grissom and the two other astronauts to lose their lives. The tragedy caused NASA to change various design issues on the Apollo capsules. Grissom was a member of Mitchell Lodge No. 228 in Mitchell, Indiana.